I started this look by painting my index and pinky fingers with three coats of Beyond the Nail - Candy Cane Crush. On my middle finger, I painted one coat of Beyond the Nail - Biscotti. 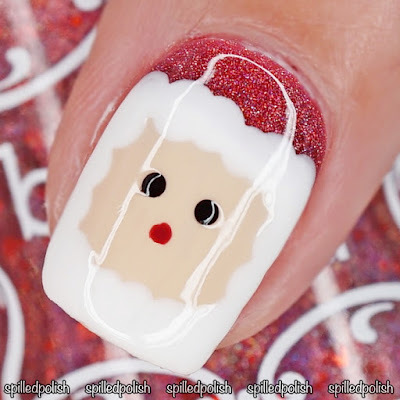 What that dried, I got a dotting tool and painted the top part of my nail (for a hat) with Beyond the Nail - Rudolph, and then dotted on Beyond the Nail - Bright White for Santa's hair/beard. I used Beyond the Nail - Deep Black & Rouge for the eyes and nose. On my ring finger, I painted the base with two thin coats of Beyond the Nail - Bright White. 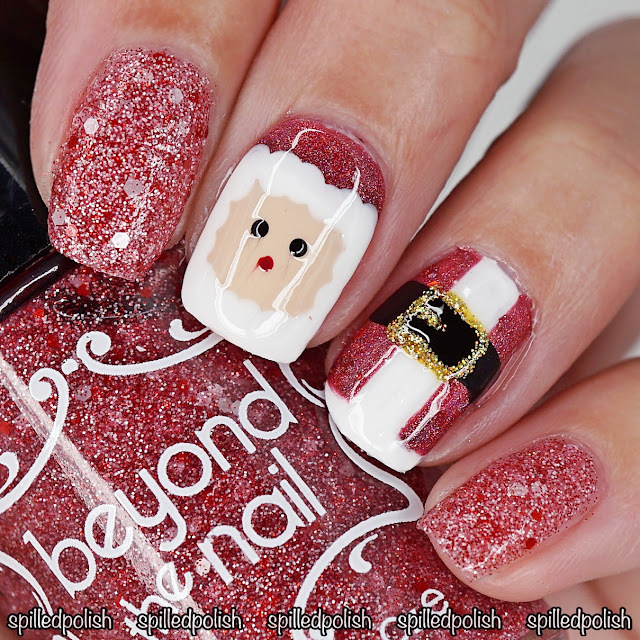 I placed down some Line Nail Guides down the middle and the bottom of my nail, and painted the open areas with Beyond the Nail - Rudolph. I peeled away the nail guides and left it to dry. With a striping brush, I painted on a thick "belt" using Beyond the Nail - Deep Black, and added a gold clasp for the belt using Beyond the Nail - Holographic Gold Microglitter. I finished everything off with one coat of CND - Creative Play Topcoat.